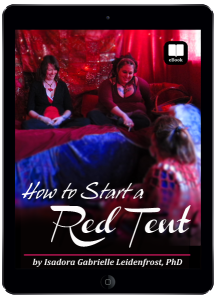 At my screenings of “Things We Don’t Talk About” many women became inspired to create a Red Tent in their community and they frequently asked me how to do it. During a 3-year period, I hosted more than a 1,000 Red Tents and helped inspire more than 50,000. I have gathered up all of my Red Tent knowledge and I am now passing it along to you. You don’t need any “formal training” to start a Red Tent. You just need the desire to bring it to your community. The beauty of the Red Tent movement is that every Red Tent can be and is different. About 6 months before I released “Things We Don’t Talk About” to the public, I had a dream that I wanted every screening to be in a Red Tent that would travel around with me, take less than 1 hour to set up, and could accommodate between 30-300 people. But how was this going to be possible?